When you’re thinking about adding a new four-legged family member to your household, it feels like there are a million issues that you have to consider first. While those of us at Boss Bull Terriers may be a little biased from spending so much time with these sweet dogs, you should know that bull terrier puppies can be the perfect addition to your family. These pups possess many traits that lead us to the conclusion that bull terrier puppies make great family dogs! The first thing that you might notice about your bull terrier puppy is their level of energy. Bull terriers are, by definition, high-energy dogs. They enjoy frequent walks, vigorous games of fetch, and they love interactive play times. Active families with children, or just active couples, would do well with these furry bundles of energy. The bull terrier breed is a small, muscular dog, and their energy comes in bursts, making them perfect for super fun playtimes! If your family has small babies at home, you might want to wait until they are old enough to handle puppy play, as bull terriers’ unbounded enthusiasm for play could accidentally harm children during playtime. This energy also makes them busy dogs, ones that won’t like to spend large amounts of the day alone. They love to be around other people and like to be included in all family activities. So, whether it’s just a walk to the mailbox, or a long car trip, try to include your pup, as bull terriers can suffer from anxiety if they don’t spend enough time with their families. If you want to introduce more dogs to your family after adopting a bull terrier, it’s important that you socialize them with other dogs from puppyhood to adulthood to give them social experience with other dogs, so that they don’t become aggressive with their new friends. 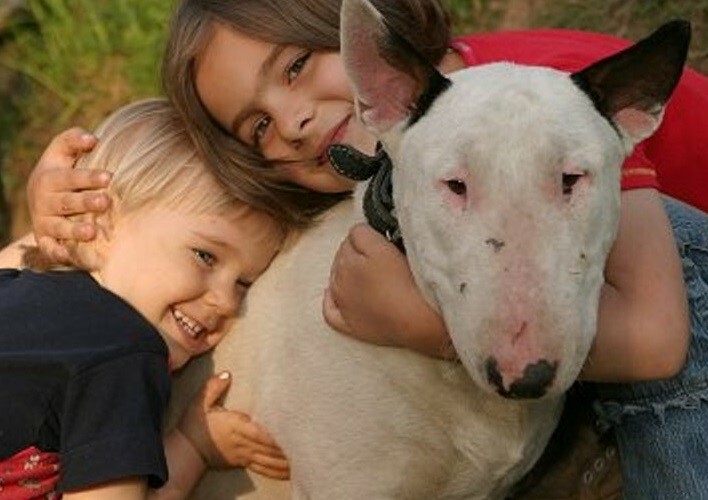 Besides their love of companionship, bull terriers are known for their intelligent, sweet-tempered, and goofy personalities. They have rightfully earned the nickname of “kid in a dog suit”. While they can be full of fun-loving energy, these dogs thrive in an indoor setting and don’t like to be cold. They will keep you laughing with their crazy antics and intelligence, but don’t neglect them, as this could lead to anxious behaviors, such as chewing on furniture and digging up rose bushes. While sweet-tempered, they can become rowdy when they aren’t trained or shown boundaries consistently, or are not played with and given social interaction regularly. Successful training requires patience, consistency, calm confidence and, most importantly, love. If you’re ready for the energy and fun-loving nature that comes from taking home a bull terrier puppy, don’t hesitate. They are lifelong and loyal companions that are always ready for adventure or to entertain you. Life with a bull terrier is never dull, we can guarantee!